The oldest yarn in my stash is the blue wool yarn that came with the 2004 edition of Knitting: learn to knit six great projects book I bought a few years ago. The book included the yarn, needles, buttons and a hook, a pretty good kit. I bought the book to help teach me to knit, not really for the yarn and other tools, with good visuals. I needed something with excellent pictures to help me along my fumbling with the basic stitches. Actually it was very helpful and I have let several people borrow it to help them too. Until last week I had no idea what to use the yarn for; it is a simple yarn nothing special. I decided it had been sitting at the bottom of my basket long enough and now it's becoming a part of that skirt for Leah. 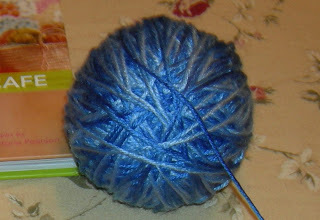 Of course due to the number of projects going on now I will be working with this yarn for a long time. There is a lot of it, always good. I suppose that I'll have to make something else with the leftovers. Maybe some bunny clothes as Leah has requested. Hmmm. What do you think that means? Yep more projects for me.